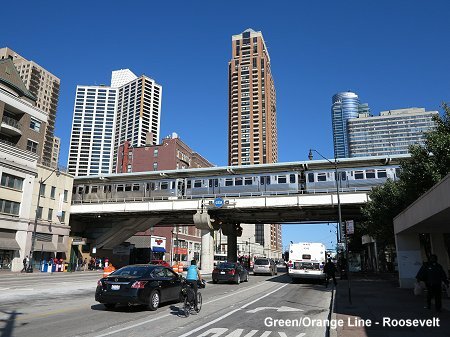 Chicago has 2.7 million inhabitants (some 9 million in the metropolitan area) and is the third largest metropolitan area in the USA (after New York and Los Angeles), situated on the western shore of Lake Michigan in the state of Illinois. 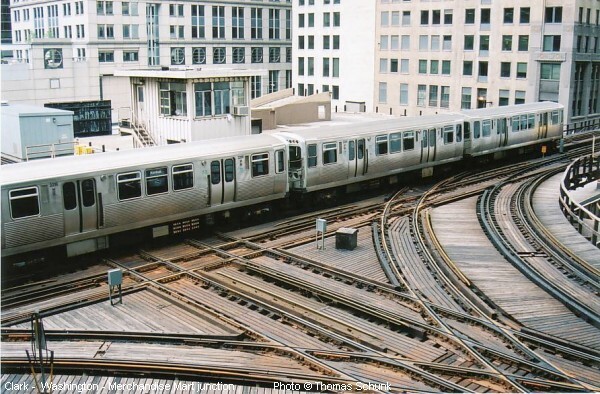 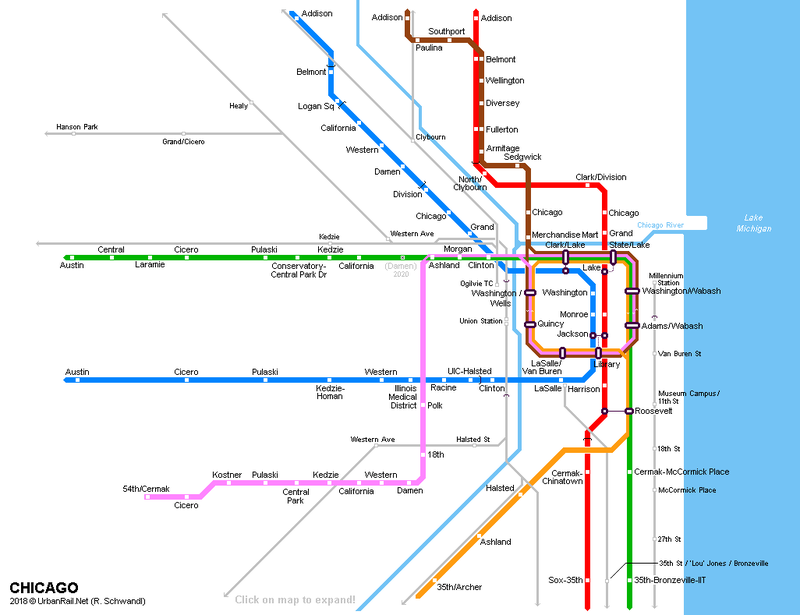 Chicago's metro is known as the 'L' as most of its network is elevated. 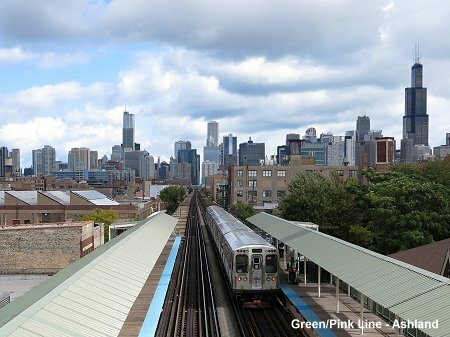 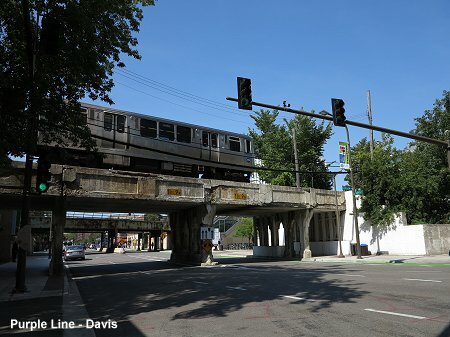 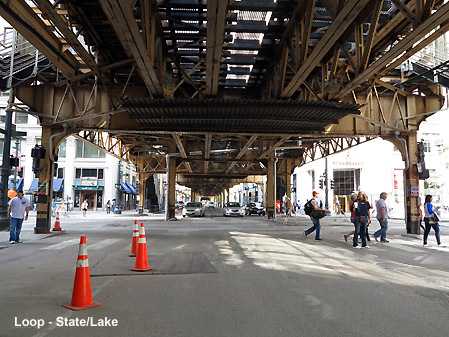 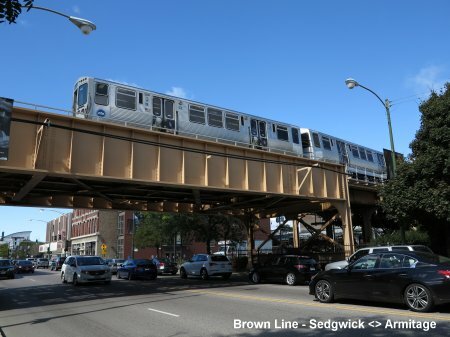 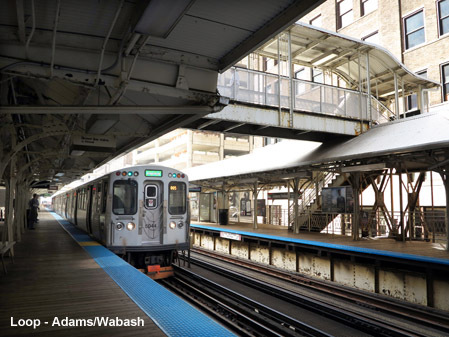 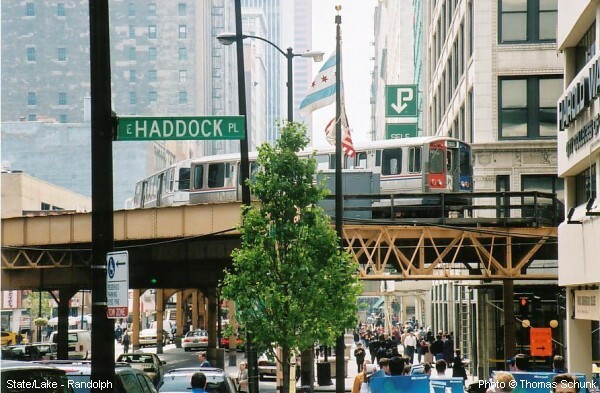 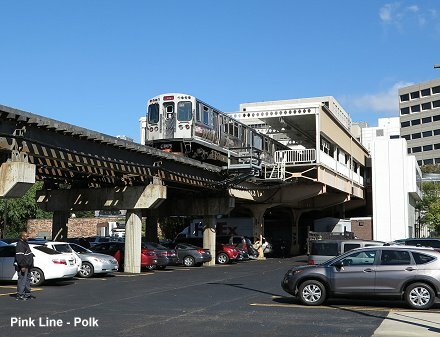 Some stretches of today's system date back to the end of the 19th century when Chicago followed New York's example to construct elevated rail lines. 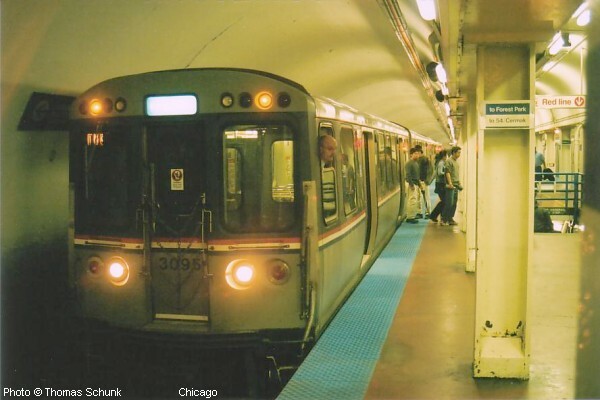 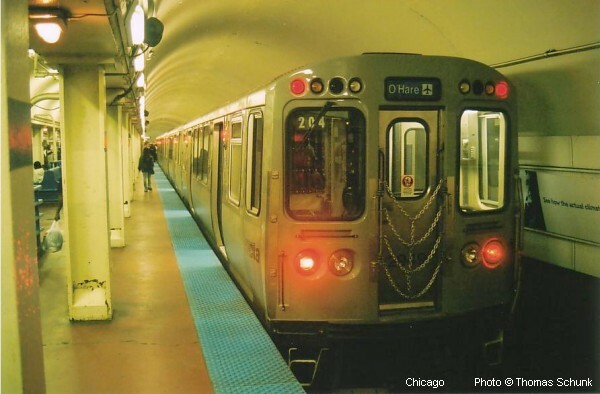 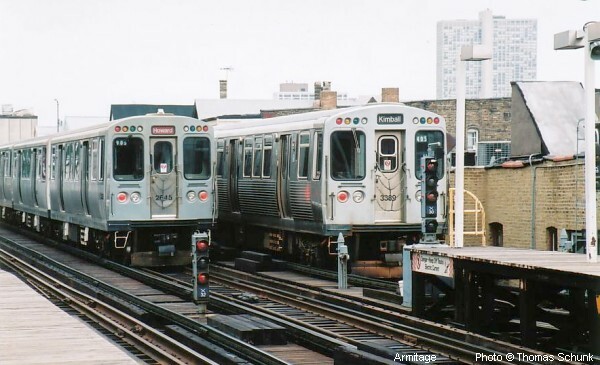 Whereas New York started early in the 20th century to put all elevated lines in Manhattan underground, Chicago maintains many of its original routes. 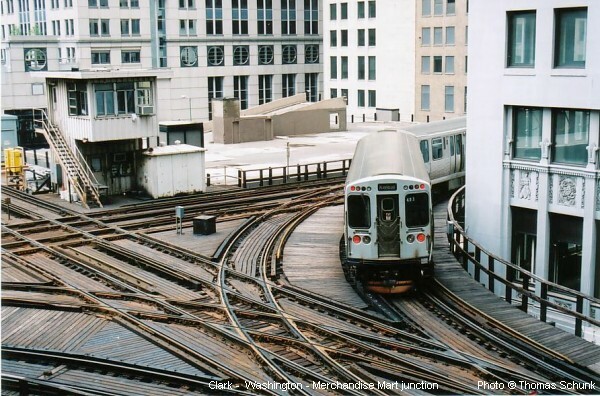 All lines spread out from the city centre where some of them form the famous elevated Loop, now one of the city's landmarks. 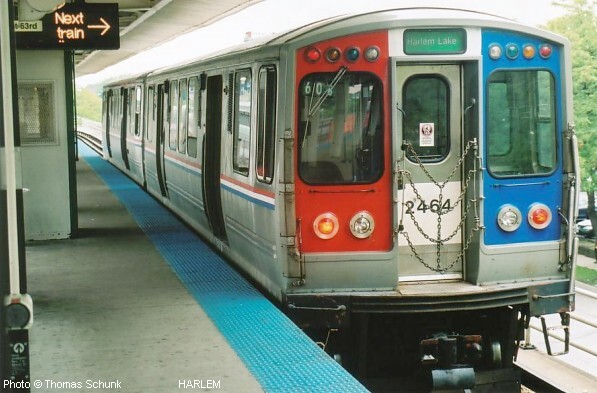 Two lines, the Blue Line and the Red Line cross the city centre north-south in a subway. 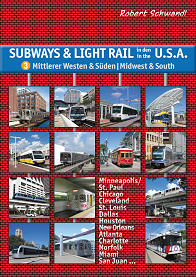 The entire network is 169 km long, with 18 km lying underground. 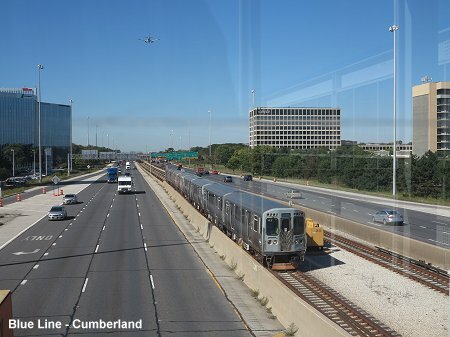 Large parts of the Blue Line and the southern leg of the Red Line run in the medians of expressways. 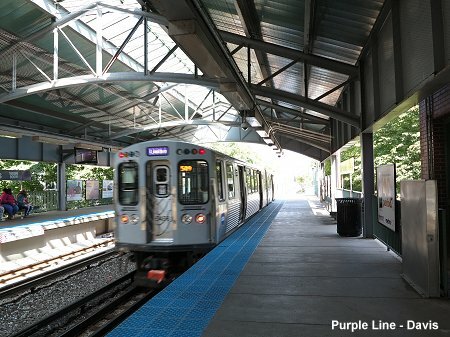 Outer sections of the Brown, Pink and Purple Line, as well as the Yellow Line, run at grade with some level crossings. 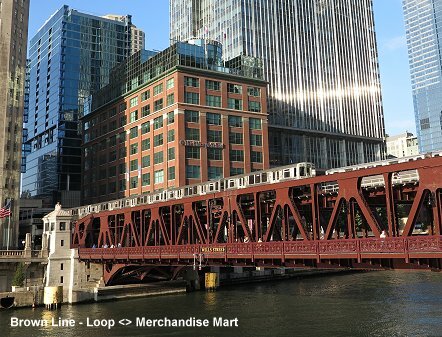 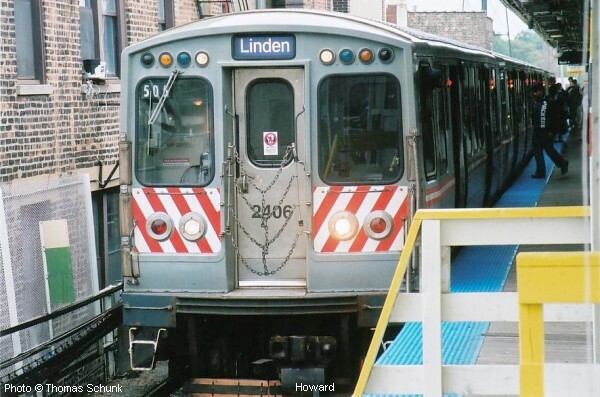 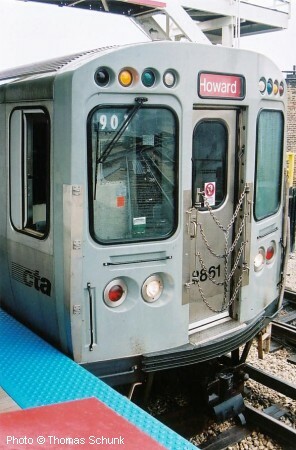 The 'L' is operated by CTA (Chicago Transit Authority). 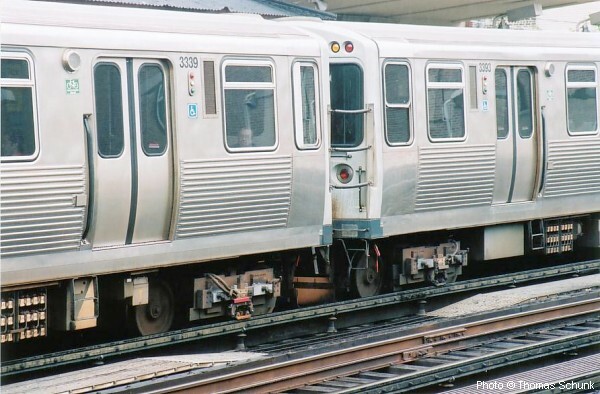 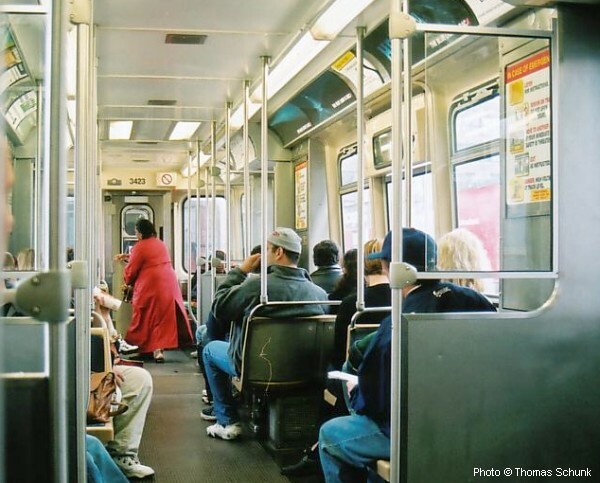 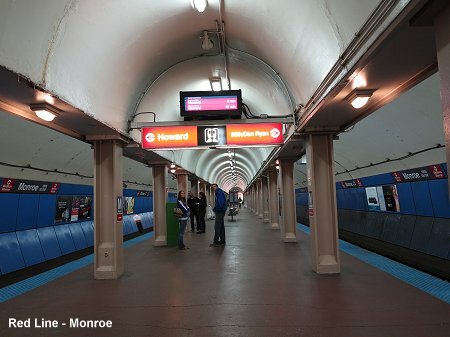 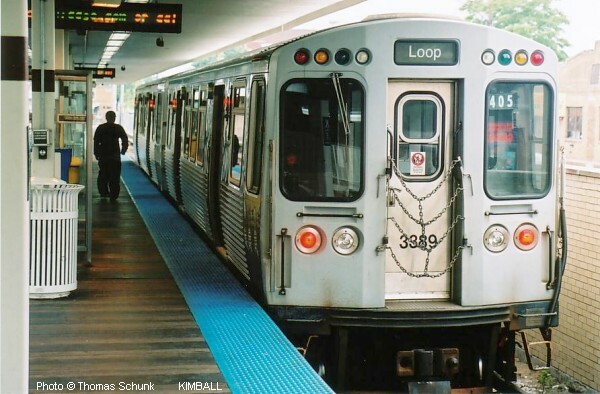 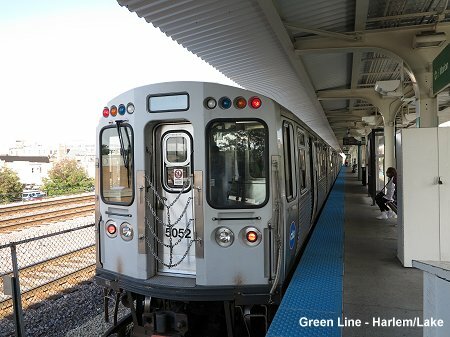 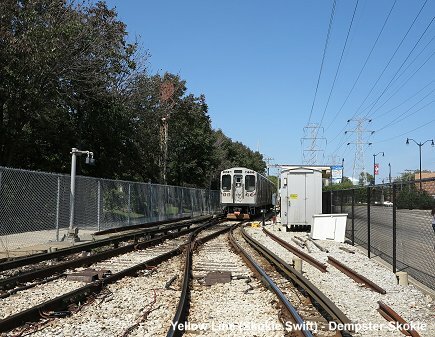 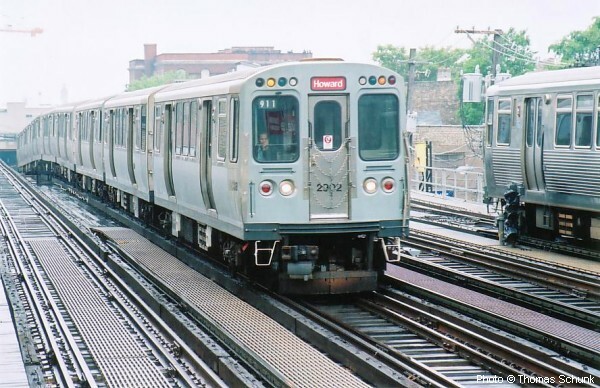 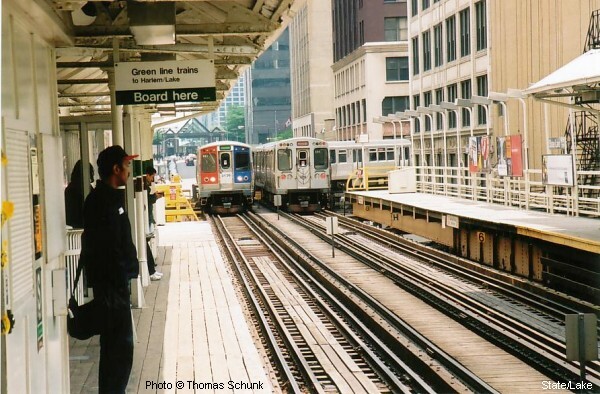 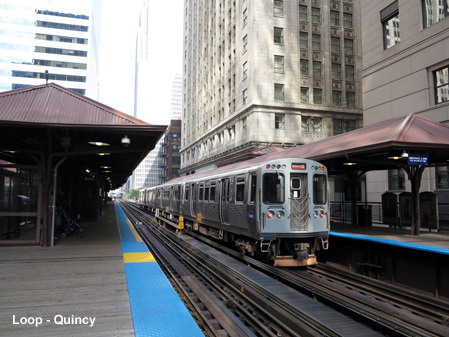 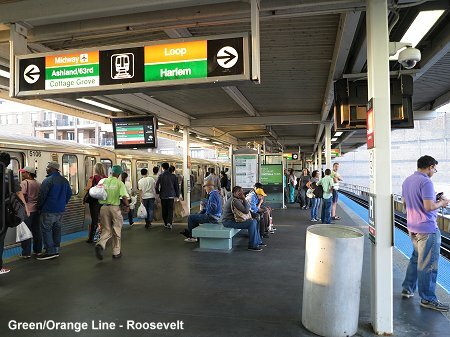 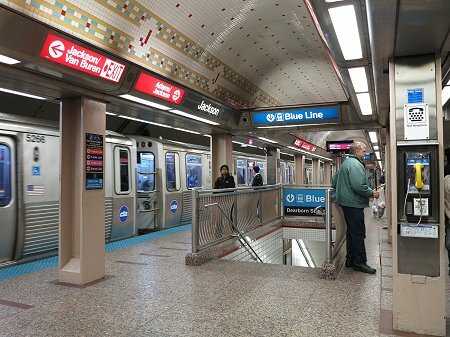 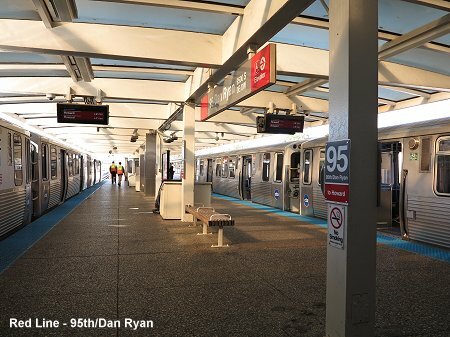 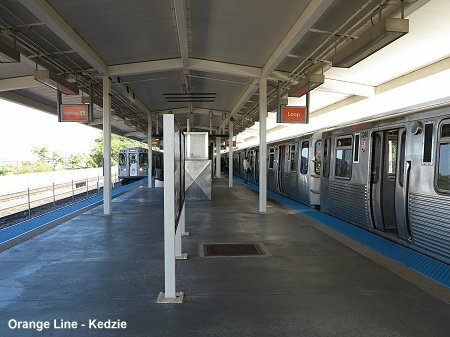 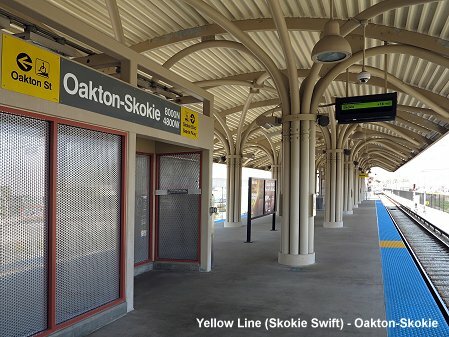 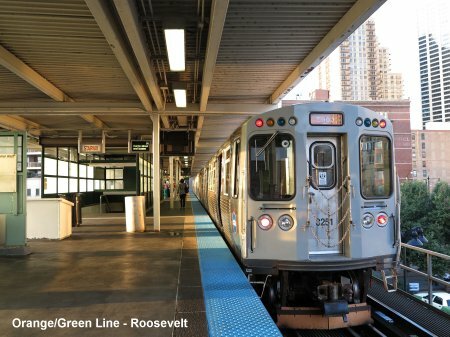 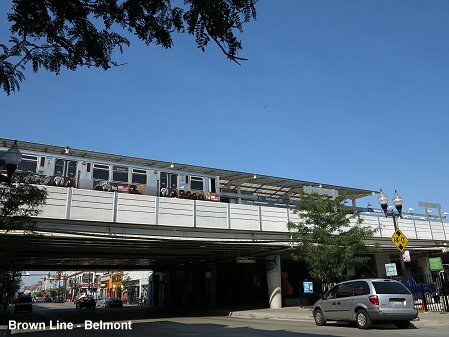 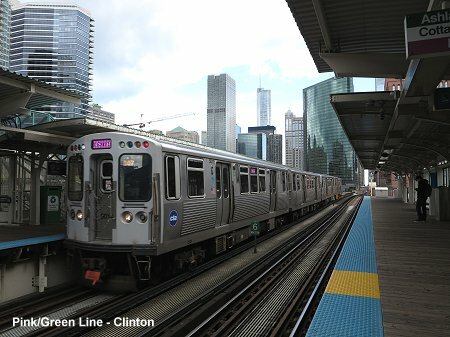 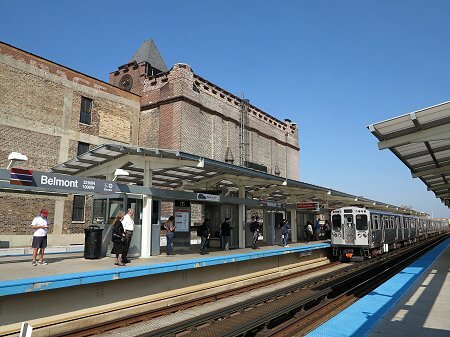 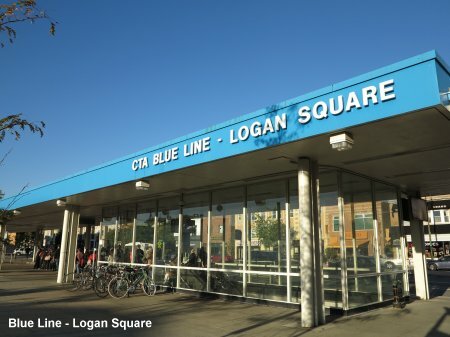 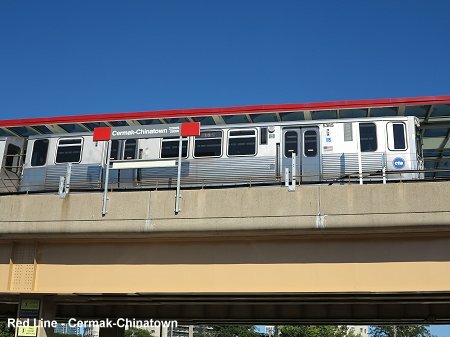 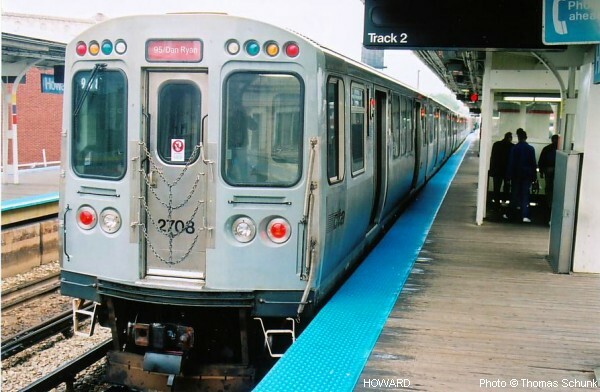 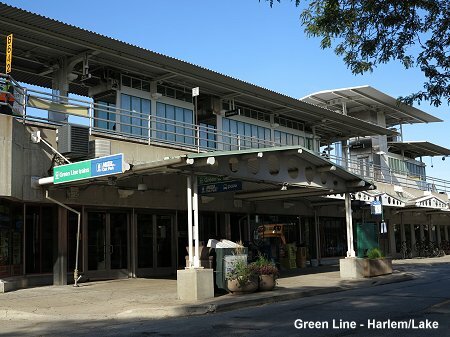 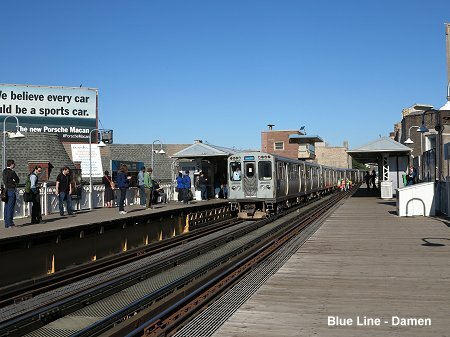 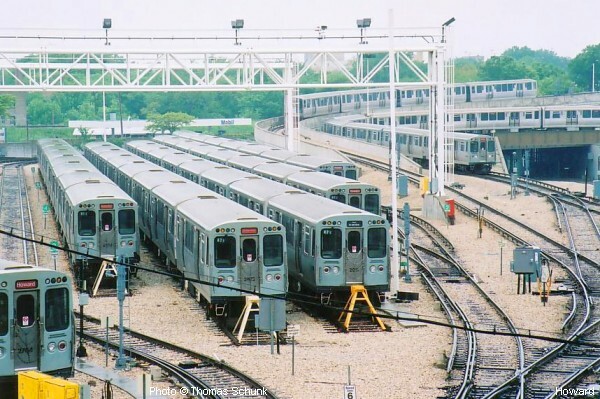 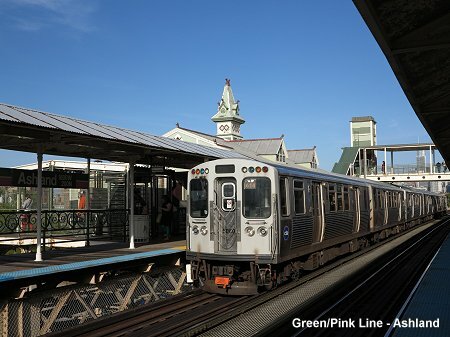 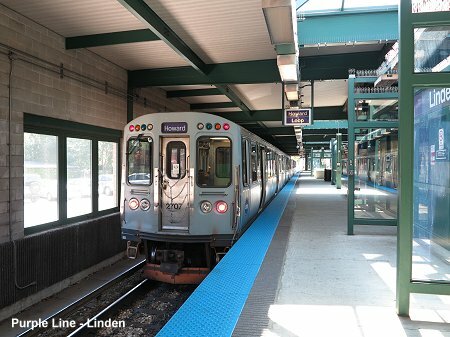 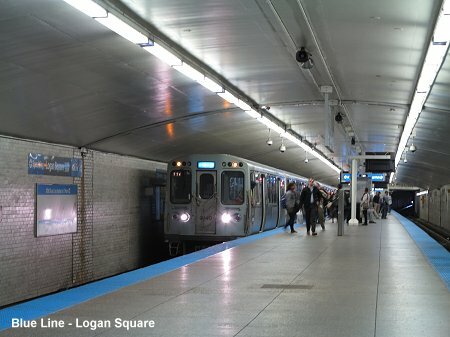 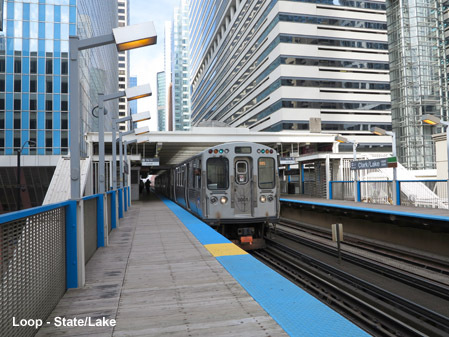 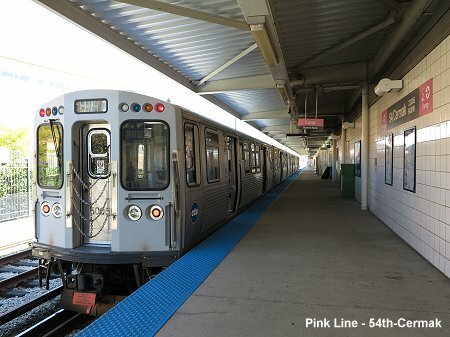 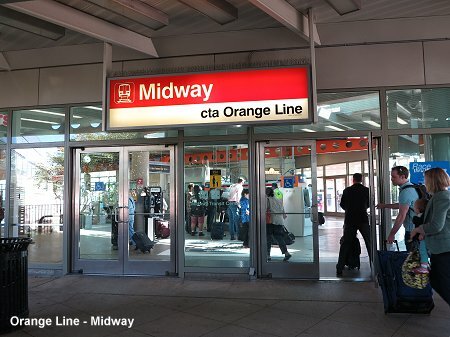 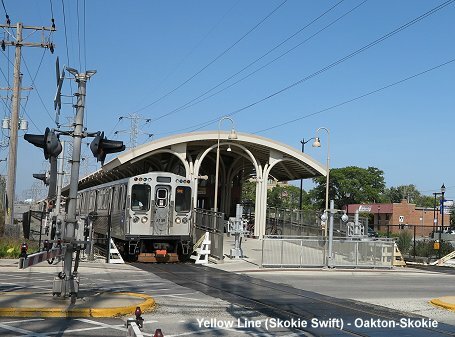 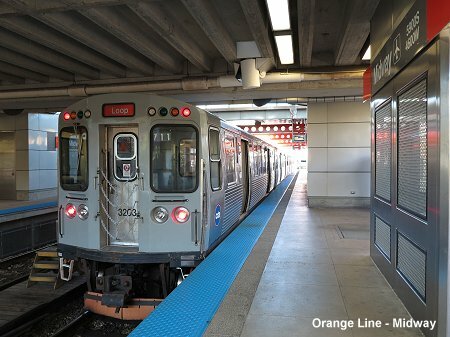 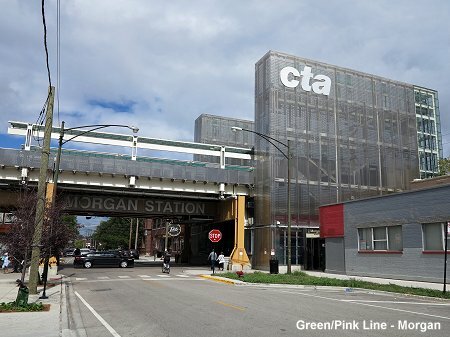 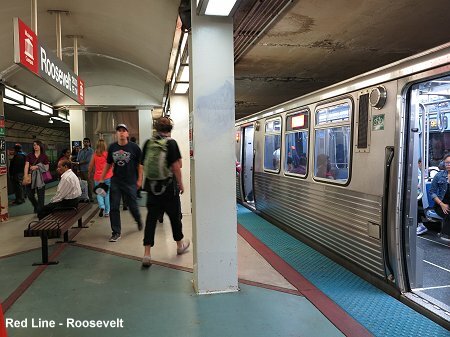 Both airports are served by CTA trains, O'Hare Airport by the Blue Line (45 min to city centre) and Midway Airport by the Orange Line (30 min to city centre). 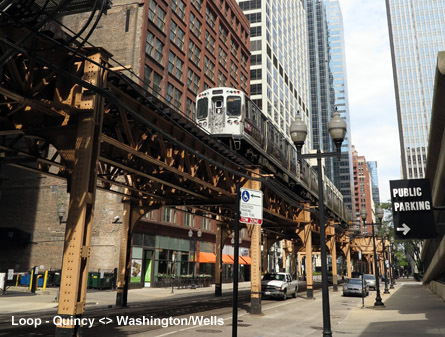 from 1892 - four different companies start operating elevated lines north, west and south of the city centre using steam engines during the first years. 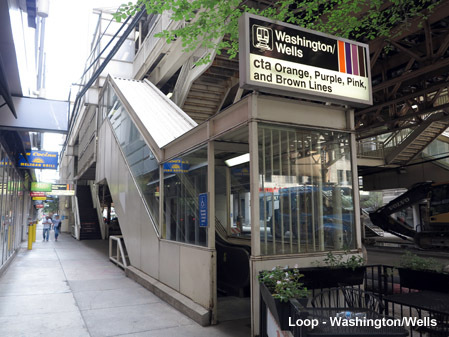 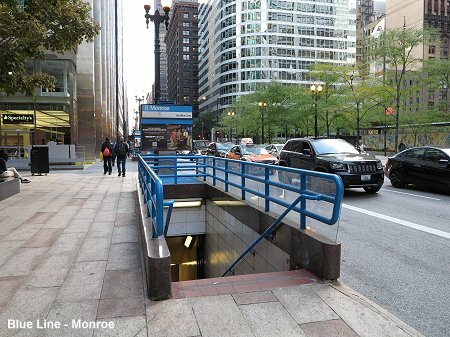 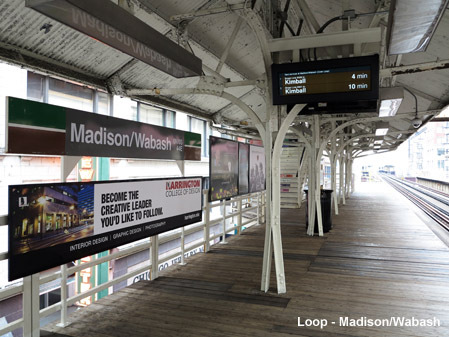 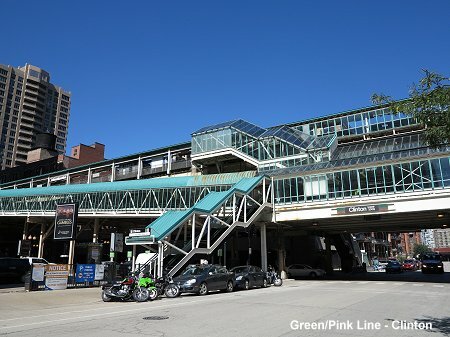 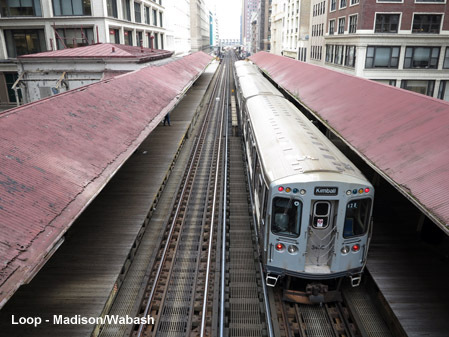 16 March 2015: Madison/Wabash station permanently closed to allow construction of Washington/Wabash station. 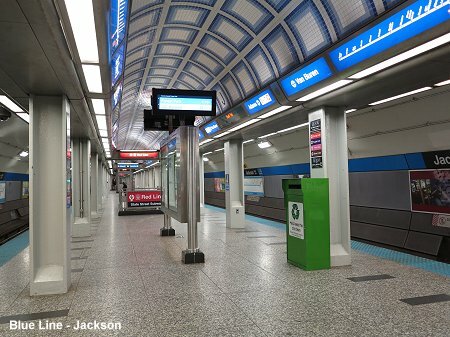 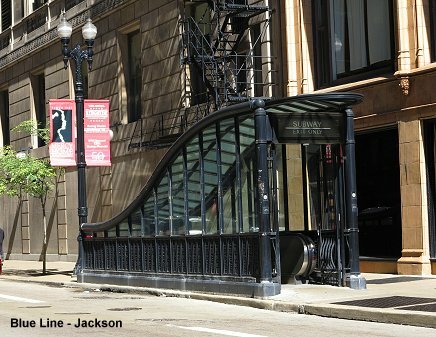 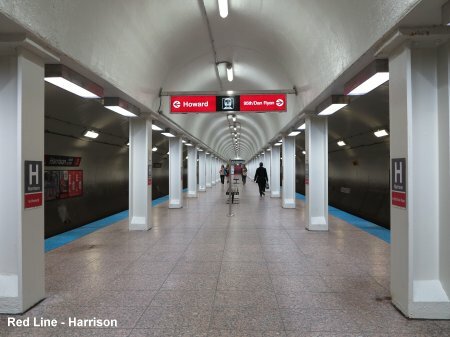 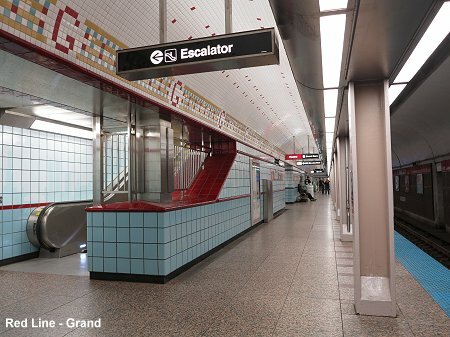 31 Aug 2017: Washington/Wabash station opened, replacing stations at Randolph/Wabash and Madison/Wabash. 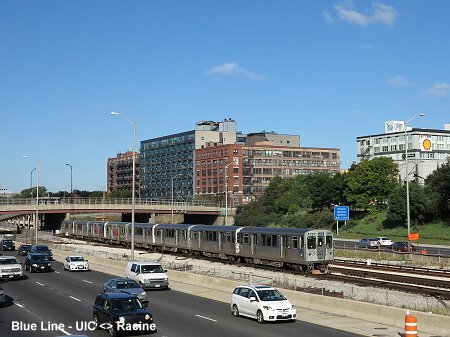 - a northwestern extension completely in the median of Kennedy Expressway opened in three stages: Jefferson Park 1970, Rosemont 1983 and finally O'Hare International Airport in 1984. 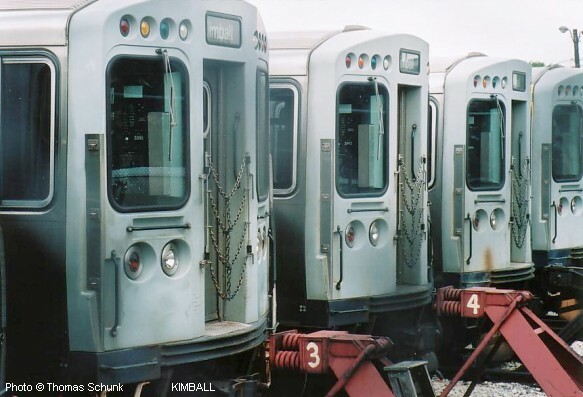 - then turns west to Kimball on an L route from 1907. 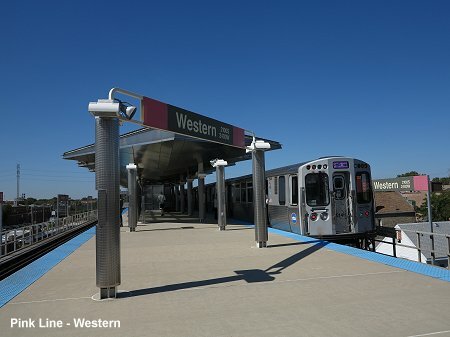 Several level crossings exist between Western and Kimball. 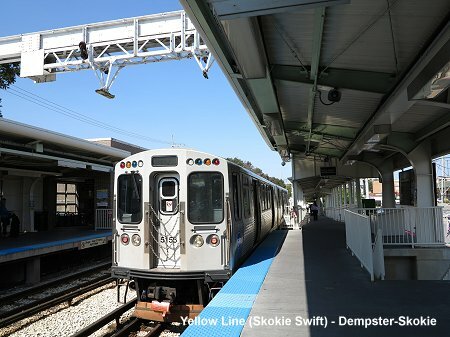 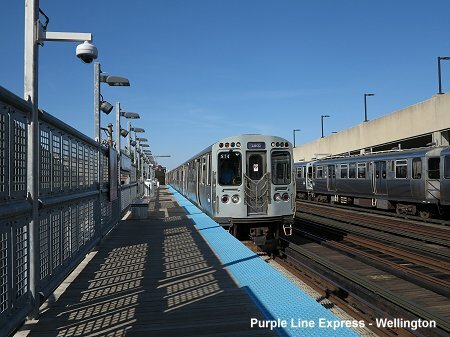 - during peak hours, the Purple Line runs express on the outer tracks from Howard to Belmont (since 23 Oct 2017 also stopping at Wilson) and then as local together with the Brown Line to the Loop, but running around it clockwise.